Played on Nintendo 3DS, copy supplied by publisher. Bye-Bye BoxBoy! is the third and final installment in the BoxBoy puzzle platforming series, which are downloadable titles on the Nintendo 3DS. Created by Kirby developers Hal Laboratory, the series centres on a BoxBoy named Qbby (pronounced “Cubey”) creating duplicates of his box body to traverse a series of puzzles to reach the end of 100+ stages. All three games are available at a cheap price, and so they look and sound like budget games, but does the gameplay stack up? As a side note, I have not played the other two games. The main game consists of more than 18 worlds with at least five stages, most containing around eight. Stages usually consist of around three puzzles players must complete to get to the door at the end. 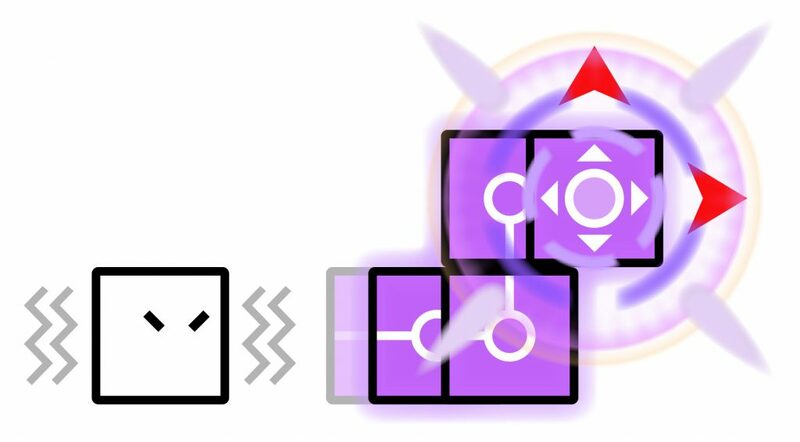 Qbby uses his box duplication ability to create chains of boxes that he can jump on to reach higher platforms; block hazards; move enemies; dodge pitfalls; unlock doors; warp and much more. Every stage has a maximum number of blocks that Qbby can chain at once, which usually ranges from three to six. Stages also have two collectable crowns that are optional, and will unlock things such as extra stages, music, costumes and comics (yes…comics) in the shop. Crowns are usually in hard to reach spots and can’t be collected if the player uses too many boxes in the stage. The player will also earn money simply by completing the stages. After each transformation a small piece of his soul dies. The great thing about the game is that a new idea is introduced almost every single stage, which keeps things fresh. The developers have used the simple mechanic of creating blocks into very deep gameplay ideas. Most worlds centre on one idea and each stage provides different gameplay scenarios. For example, one world gives Qbby’s boxes rocket capabilities, allowing him to reach new heights. Each stage in that world will try different ideas with the box rockets. Other concepts explored in these worlds include boxes that can explode through walls, inversed gravity, remote boxes and water buoyancy. Stages may also include Qbabies, where Qbby has to guide smaller characters to the end of the level alongside him while protecting them from harm. Thankfully there’s a good checkpoint system, with dying and/or the quick restart option taking the player to the start of that particular puzzle rather than starting the entire stage again. Most stages can be completed in a manner of minutes, but of course will take longer if a player is stumped. And being stumped often is a possibility, with plenty of tough puzzles. The miracle of child birth. 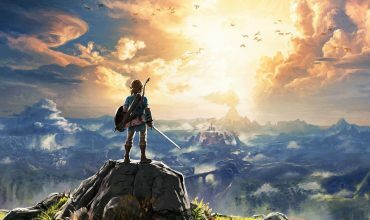 The game’s tutorials do their job without being patronising, usually in the form of a quick animation in the background when a new concept is introduced. The game has a hint system at a price where players can use a Play Coin (remember those?) to see the best spot for the blocks in a particular puzzle. At times the puzzles can scratch heads so this system will prevent quite a few rage quits. The story is so ridiculously simple, and it’s amazing how little it tells, yet I liked it. The plot is simply Qbby and friends trying to save his planet or homeland from an evil that is represented as a black smoke. As barebones as that is, I was surprised at how moved I was at the ending. Also barebones is the graphics and sound. It may be a call-back to the first Kirby game on the original Gameboy, as well as the puzzle platformers from that era, but the BoxBoy universe is almost entirely represented in monochrome black and white. There is colour on some characters, backgrounds and objects to help those elements stand out. There is a certain charm to this look, but the important thing is they don’t take anything away from the game or make it more difficult to play. As for the music, it’s also old school but not in a good way. One of the main in-stage themes drove me insane hearing it over and over again so I turned the volume off. Not all the tunes are so jarring, serving as catchy background music. This box is only angry because it has to live with the soundtrack. The shop has optional challenge modes containing worlds with rules. These include restricting the player from tossing blocks; requiring all crowns be collected before reaching the end; failing if Qbby falls a certain distance and others. These were good ways to freshen up the gameplay but I personally preferred the main stages. There are also extra worlds after completing the story. Bye-Bye BoxBoy! is compatible with Kirby series amiibo, plus the Qbby amiibo which unlock costumes. Players with data from the other two games can also unlock a graphical scheme to make Bye-Bye BoxBoy! look like a Game Boy game with the monochromic shades of green, black and white. After completing the main story and trying a couple of extra stages, I felt like I was done with Bye-Bye BoxBoy!, but I feel like it’s a perfect title to revisit on my international flight next month. 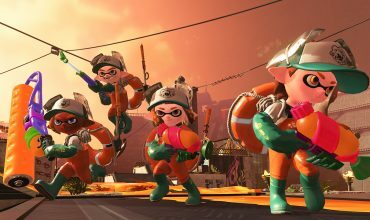 The game is sold at a fairly cheap price, and there’s a lot of content included with about five to 10 hours for the main story. 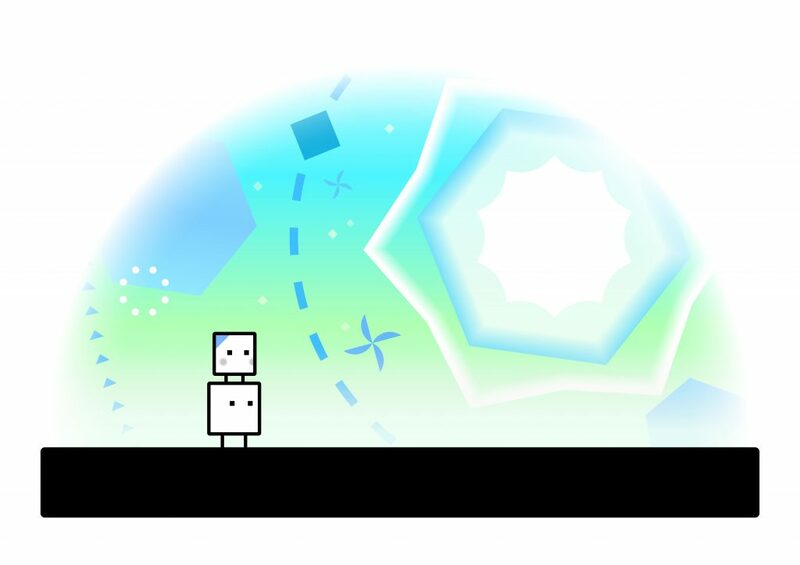 In the Nintendo eShop is a demo containing content from all three games of the series, so everyone can have a taste of the BoxBoy franchise. Bye-Bye BoxBoy! is an inventive and challenging puzzle platformer that’s well suited to short gameplay sessions. The graphics and sound may be simplistic but the game offers a wealth of content for a cheap price. Box Stefan in on Twitter @stefanbradley3 and don’t forget to follow on Twitter and like us on Facebook.